Based on the adventures of a high school nerd who can magically transform into a wild animal, Cool Wolf is a 5 reel, 243 ways to win video slot from Microgaming. It comes with rolling reel re-spins, stacked wilds and a bonus feature where you can win 25 free spins with multipliers that can top 10x. Play from between 50p and £250 per spin. Visually, Cool Wolf is a bright and flashy affair – the imagery is reminiscent of a 1950s style teen movie. Joining the lower value A to J playing cards are sunglasses and money, a cinema, classic car and cheerleaders. The most rewarding standard symbol is the schoolboy by day and wolf by night who pays 10 times your total stake if you land 5 on successive reels. The Cool Wolf logo is the wild – it replaces everything apart from the scatter and can appear fully stacked to fill any or all of the middle 3 reels. When the Howling Wild feature is randomly triggered, reels 2, 3 or 4 will turn fully wild and you’ll be guaranteed a winner. Cool Wolf also comes with Rolling Reels feature – after a successful spin, a paw will scratch away the winning symbols and the symbols above will take their place. The reel rolls continue until there’s one where no new winning combination is visible. The only exception comes during the Howling Wild feature where the Rolling Reels aren’t in play. They are active in the free spins feature though. To trigger the Free Spins feature, you’ll need to land 3, 4 or 5 of the scatter symbol anywhere on the reels. You’ll then receive 15, 20 or 25 free spins. The Rolling Reels are very much in play here, awarding a multiplier prize for each successive win. They begin at 1x for the first win and steadily increase to 2x, 3x, 4x, 5x and 10x for each subsequent Rolling Reel win. The variance here is in the medium range – as usual, the best winning opportunities will come via the Free Spins feature where the expanding multipliers can quickly have an impact if you get on a roll. 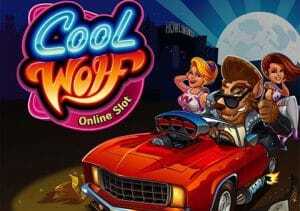 With its light-hearted visuals and rockabilly backing track, Cool Wolf is a very entertaining video slot to play. The range of features isn’t the widest but what’s on offer is solid enough, especially the free spins feature. Get lucky with those Rolling Reels in the feature and the hefty multipliers could leave you howling with delight. If you like Rolling Reels, I recommend Jungle Jim El Dorado which is excellent.